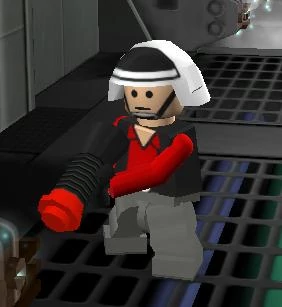 I was playing LEGO Star Wars: The Complete Saga recently (don't judge me), and while doing the first level for A New Hope, there is a character you can play as named "Rebel Friend." He doesn't seem to be based on any existing character that I know of. My questions are who is he and where did he come from? I took that "Rebel Friend" to be the strikingly-blue-eyed rebel who features prominently in the first shipboard scenes of A New Hope. I don't have any basis for this, except that that guy feels like the first brief viewpoint character the movie has, even though he dies without having a single line (except his death yell). Although his appearance is brief, he was the first character in Star Wars that any audience could relate to. Not the answer you're looking for? Browse other questions tagged star-wars a-new-hope the-rebel-alliance lego lego-star-wars or ask your own question. How many planets did the Rebel Alliance control? Did Luke really “stumble across” the recording? Book Author, Screen Play Author, and Director are the same: Which is canon? Was the Death Star cost effective?